Fragment published in Proceso, written by Jose Gil Olmos. 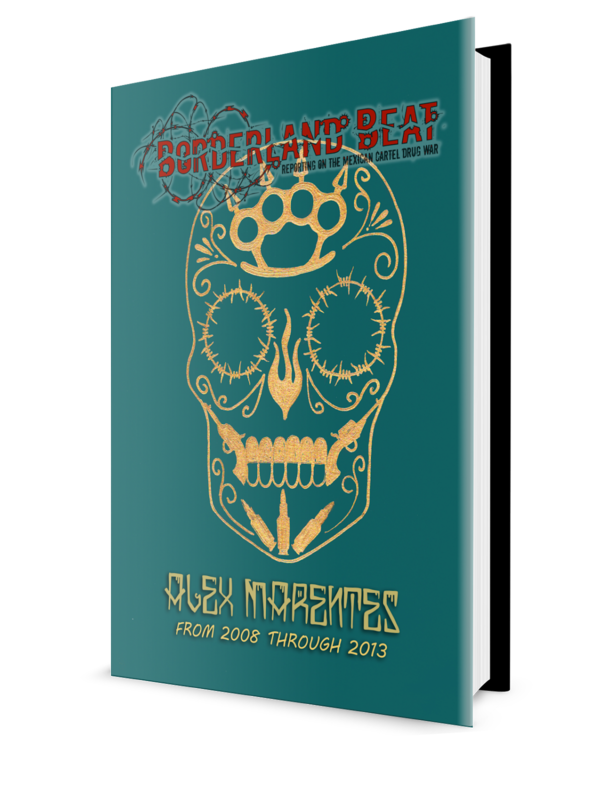 [Note: As Borderland Beat readers are well aware, in Mexico, schools that train teachers are called "escuelas normales". Students and teachers in these schools are called "normalistas", while the shorthand term for these schools is "normal" or "normales". I will use these terms in translating this article, originally by Jose Gil Olmos, to express his thoughts accurately. ---un vato]. 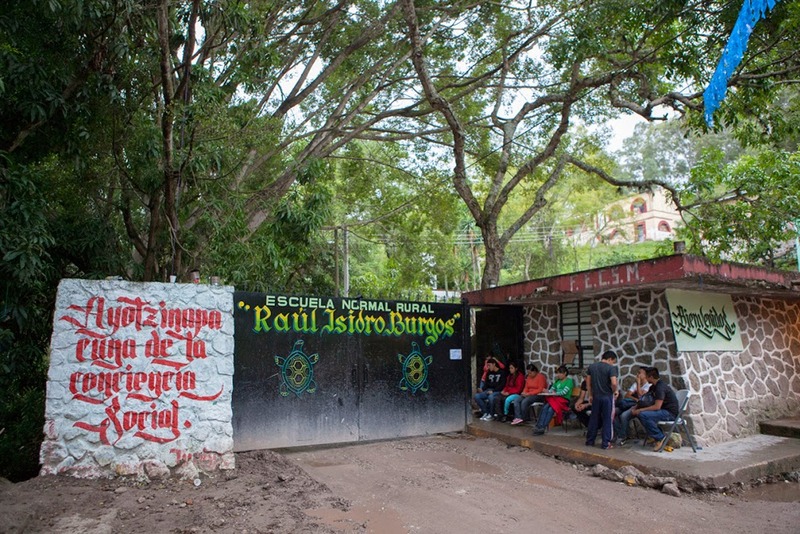 Escuela NormalRural Raul Isidro Burgos: "Ayotzinapa; Birthplace of Social Conscience." The violence against the "normales" (teachers schools) reached its limit in Iguala, Guerrero, with the attack against the Ayotzinapa students. The disappearance of 43 of their fellow students triggered movements by their counterparts in other states and is evidence that the attempt to make them disappear or to transform them into centers for training "tourism techs" could initiate a popular struggle, a broad expression of rebellion, says researcher Tanalis Padilla, who is writing a book on this subject, to Proceso. These learning centers represent an obstacle for the [PRI's] neoliberalist project. Abandoned by by the federal government for decades, the rural normales -- once a revolutionary symbol for the education of campesinos (peasants farmers)-- lack the funds to provide for their more than 7,000 students, who now look for subsistence on the streets, risking systematic attacks by the police and organized crime groups, as was the case this past September 26 in Iguala, Guerrero, with the Ayotzinapa students. Of the original 29 institutions, only 17 remain. In the past 40 years, in addition to ever more frequent and violent attacks, state and federal governments have tried at all costs to close them down or to transform them into technical education centers to produce mere "tourism techs". That tendency was manifested in the year 2000, when the Escuela Normal Luis Villarreal, in El Mexe, Hidalgo, was subjected to these attacks, and eight years later, it had converted into a "polytechnic" university. In November, 2012, it was the Normal Vasco de Quiroga's turn, in Tripetio, Michoacan, where there were 133 arrests. In the interim, from 2007 to 2011, the repression of students from the Normal Raul Isidro Burgos-- known as Ayotzinapa -- was unleashed in Guerrero. During that period, two young men were killed by gunfire by state police. The destabilization against the Guerrero students sharpened this past September 26, when the Iguala police killed two of them. That day, 43 normalistas also disappeared. On Wednesday, (September) 8, after the protest march in Chilpancingo, a normalista from Ayotzinapa got up on the platform and took the microphone to demand the return of his 43 friends: "The State regards us as the enemy, but we're simply students". 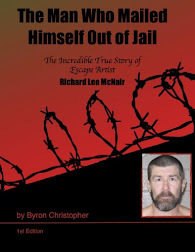 His voice echoed thunderously from the walls of the Palace of Government. Since the 1960s, the federal government has associated the rural normales with rebellion, because they have produced social activists such as Othon Salazar, Pablo Gomez, Jose Santos Valdez, Misael Nunez Acosta, as well as guerrilla fighters such as Lucio Cabanas and Genaro Vazquez. For Tanalis Padilla -- who teaches history at Dartmouth College, a private university in New Hampshire, and who is writing a book about rural normales--, attacks against these schools began with the Gustavo Diaz Ordaz administration. The authorities consider them as producers of rebellious students. The truth is something else, she says from London: those centers do not enrich the [PRI's] neoliberal education project. She insists, too: Elba Esther Gordillo, the former leader of the National Syndicate of Education Workers (SNTE: Sindicato Nacional de Trabajadores de la Educacion), was determined to convert the rural normales into centers for training "tourism technicians". If the state and federal determination remains in effect, as everything indicates it will, that may provoke a social uprising, because many campesinos only have access to an education in those centers of learning. PRD congressman Miguel Alonso Raya, a graduate of the normal in El Mexe, characterizes as "stupidity" any attempt to bury this project [the normalista project] only because it is considered a "breeding place for guerrillas". "It was from 1969 forward -- he comments -- that the attack on this educational project began. President Diaz Ordaz ordered the elimination of 14 schools and the conversion of some of them into agricultural secondary schools, which is what happened with the normales in Tomatan, Tamaulipas, and the one at Roque, in Guanajuato. "Even then, there were great shortages (of basic necessities) and much stigmatization because Arturo Gamiz, who took part in the assault on the military barracks in Ciudad Madera; Lucio Cabanas, leader of the Party of the Poor, and many more who were in the September 23 Communist League and other guerrilla movements, all came from there. They seized on that fact to say that they (rural normales) were breeding grounds for guerrillas and subversives." From the beginning, normales were conceived as part of a revolutionary educational project for peasant farmers (campesinos). Their immediate predecessors were the regional normales and the central agricultural schools, points out researcher Tanalis Padilla in a study. During the administration of General Lazaro Cardenas, they were extended into the poorest regions and received full official support without losing their essence. Their academic programs had a socialist character and included practical activities so that the students could learn diverse occupations; they had modules for agricultural activities and also for cultural (activities)-- such as popular music and regional dances --, as well as for imparting civic and patriotic values. They also foresaw sports, and a political module in which they studied Marxism-Leninism-- which is is still active -- to analyze the political and social reality of the nation. But all that support was withdrawn after the 1968 student movement and the appearance of guerrilla groups in several parts of the nation. The rural normales were abandoned and began to be attacked by the government. The 17 schools that still exist are considered schools of higher education, although they do not have a specific budget appropriation in the Law on Federal Budget Appropriations (Ley de Presupuesto de Egresos de la Federacion). Today, financial support is at the discretion of every state governor. In addition, many professors do not have the qualifications to educate their students, and openings for new hires have been canceled. For the authorities, the student community in these schools is rebellious and many of their students don't study; these students survive on whatever they are given for food, and there is no academic discipline in the classrooms, Alonso Raya admits. The view is desolate for these 17 schools, researcher Tanalis Padilla declares: "In order to obtain food and resources after graduating, the normalistas have resorted to (social) mobilizations. Some schools are defending only the right to an education, in this case, rural education", she comments from London. "They have avoided talking about the social context, that these are young people from humble origins-- many of them from poor campesino or indigenous families --; they are treated like criminals and agitators. That's where the repression comes from, like the one in 2011, when two students were murdered, and the one last month, in which Iguala policemen killed six people and disappeared 43 normalistas from Ayotzinapa." It is in this context that the disappearance of the young men must be analyzed. "We must consider and understand the last attack within a general context in which the rural normales and their students have been criminalized. First, they began to neglect them since the middle of the past century because they were considered to be breeding grounds for communists and guerrillas; afterwards, there began political attacks against the student community. "They (the authorities) allowed the rural normales to fail, and it was precisely that precarious situation that forced the students to look for outside resources so they could have even the most basic rights". And she explains: the rural normales have been abandoned because they have no place in the neoliberalist privatization model that recent presidents have adopted. "The do not fit within a neoliberalist policy where financing for education and the rights that the people won during the Revolution and which are enshrined in the Constitution have slowly been retreating," the interviewee asserts. That is why, says Padilla, they (the normales) are trapped between a political and economic privatization project and the government's violence and repression against social movements, particularly against campesinos (peasant farmers) and indigenous people. The 17 escuelas normales have a population greater than 7,300 students, but the demand (for them) persists. According to information from the Department of Public Education (SEP: Secretaria de Educacion Publica), except for the schools in San Jose de las Flores, Tamaulipas, and Saucillo, Chihuahua, the others operate with frequent interruptions; some of them do not comply with even half of the 200 day school calendar. The majority of the schools are in a precarious condition and the professors are poorly educated. On Wednesday, (September) 8, in his appearance before the Senate, the Secretary of the SEP, Emilio Chuayffet, assured everybody that the rural normales are not going to disappear, because the federal government is committed to providing them full support. For Congressman Alonso Raya, it would be foolishness to eliminate them. If the authorities do so, he warns, no longer will there be training of teachers who can go to the poorest regions in the country, which would be very serious. I'm not trying to get off topic but why no update/post on Dr Mireles in the last 2 months? Well, it's a sad story. I wish these poor people well. Not all "peasants" (campesinos) attend Normal Schools. All people whom desire to become teachers attend Normal Schools, not just people from the country side. This particular Normal School, in this article, just happen to enroll a lot of students from the country side, even though past articles describe some students being from Mexico City. Mexico, just as we used to do in the past here in the U.S., produce their teachers, not just elementary but also junior high and prep schools, in Normal Schools. Here in Texas, Southwest Texas State, Sam Houston University, Steven F. Austin University, used to be Normal Schools. This is the truth and the reality of these schools, this article is 100% right on. With respect to the recent events, did they really forcibly hijack buses or was that made up by the government? This is great reporting. Keep it up. Viva Mireles! A perfect example of a failed country and a screwed up corrupt government. May the people rise and rebel. @ 4:19 because nobody cares he is just the spur of the moment thing a t-shirt at best at the end of the day everyone goes about there lives and forgets about what is going on with the rest of the world FACT!!! --Wait a minute, what happens to the other 8%??? properties so you can work and go to school in peace. An armed populace is harder to kill. When somebody wants your future killed, that's called extermination. Es una lastima que los que deverian estar para ayudar a los guerrerenses son los mismos que los estan exterminando. EL GOBIERNO DE MEXICO ESTA PODRIDO. Thanks for this article. I find it very good that you include subjects like this so that BB is not just about blood and gore, but shows the background. The brewing discontent is soon going to become a real threat to the governing elite of Mexico and they will increasingly have to employ government resources to subdue the rise of the people. Oh yes,know all about them,and nothing good to say about them neither.. These indigenous peoples don't have the money it takes.Next thing you will have drunken spoilt students going to Mexican polytechnics because its"nice in Mexico"great for a couple of months,meanwhile Mexicans wont get no education?Wait a minute,isn't that the whole idea,Tourism techs? Tourism techs? Is that where people from other Countries go to learn or where poor residents learn to give tours on donkeys? Cuáles? Its all wrong look at this way the normalistas are Republican and the govt is the communist. The govt took the right away from the Mexican citizen to protect him self. The bad guy is all ways going to have the a k 47 . But the poor a 22.. The govt is taking away education to the normalistes so the govt can control them. --proceso/recuerda marcos el pasado represor del gabinete de pena nieto.